50 Heartbreaks (and I’m still in love with YOUkraine), will break your heart fifty ways, and in the end manage to put it back together again. Jenna Bean Veatch and Nadia Tarnawsky premiered this whimsical dance-theater piece at the Annex Theater on Tuesday, October 1, 2013. In one hour and fifteen minutes, the two performers extracted cathartic reactions from the audience by giving a brief history of Ukraine during World War II from both personal and national perspectives, as well as dive into the lives of Veatch and Tarnawsky. Their genuine performance was startling, contributing to an unforgettable and touching experience. Veatch and Tarnawsky presented each one of the title’s fifty heartbreaks sequentially, yet not chronologically, through beautiful paintings on cardboard and props by Susannah Anderson. They set the work to 1960s breakup songs, along with Ukrainian folk music sung a cappella or recorded. Each painting depicted the story and heartbreak number’s performance to follow. During the performance, Veatch explained how even though the vocals were in Ukrainian, she could feel the emotion behind them. Later on Tarnawsky added, with a hint of melancholy, how she had learned these folk songs, which taught men and women in wedded relationships how to perform and stay safe from physical abuse, as a child. 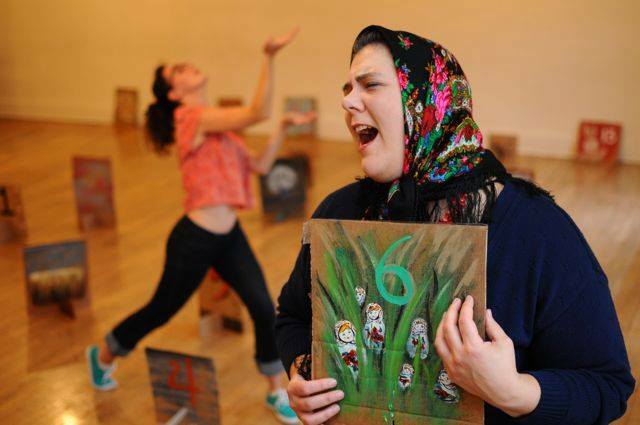 The two performers jumped into different roles to educate the audience about Ukrainian culture as well as the number of deaths that occurred in their country during WWII, and also embodied important family members in each other’s lives. Apart from portraying different individuals, they narrated their own encounters with heartbreak which stemmed from physically abusive relationships and having been left abandoned with unfulfilled dreams of a life together. These stories were intertwined with videos; Veatch’s beautiful stop motion vignettes depicted two bunny-doll’s love story, and the audience got to meet Tarnawsky’s father on video as he recounted his ache-inducing memories from WWII. Even though their stories were heartbreaking, both performers introduced comedy to their tales. Tarnawsky recounted how much she missed her parents even though they had a interesting way of understanding what each other meant. At one time they both heard their son tell them to “go live in a condom” instead of condo. Tarnawsky enacted her parents’ conversation while blowing up a condom (where the heartbreak number 20 was painted). Veatch presented heartbreaks #26-31, which were all about what she hated since having her heart broken. The list included laughter, the word ‘we’, music, ‘your face,’ and the absence of love notes on the fridge. Together, they also presented a quirky and funny bunny dance. 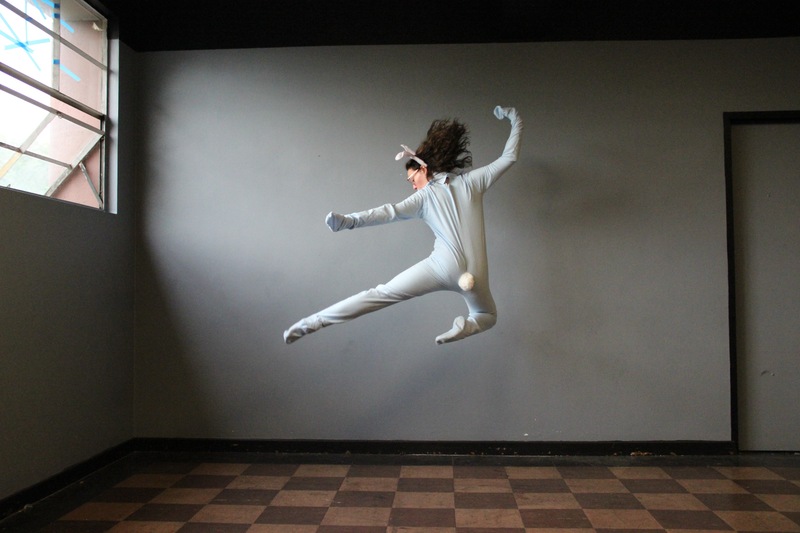 With Veatch dressed as a bunny, and Tarnawsky with her hair covered as traditional Ukrainian women do, the two danced to “Popcorn” by Gershon Kingsley. The choreography was simple, a head bob to the right then to the left, raising the right arm, then the left in synchronization with the music’s accents. Its placement midway through the show broke the seriousness and tragedy, allowing the audience to catch their breath. It is remarkable how Veatch and Tarnawsky pulled off presenting so many stories ranging from bunnies to death all under the umbrella of heartbreak. Their sincerity and charisma throughout the performance made for a truly refreshing show. 50 Heartbreaks (and I’m still in love with YOUkraine) will continue through October 4, 2013. Performances are nightly at 8 PM at the Annex Theatre. Tickets can be purchased here.